is an owner-operated pet spa that offers boarding, grooming, training and veterinary services at affordable rates. 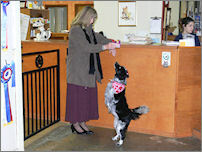 Our professional staff is highly trained and offers extremely caring service to make your dog or cat feel close to home. Whether you need your Silky Terrier bathed and clipped, to board your Black Lab for a weekend, or to get shots for your brand new kitten, we do it all! We now are offering pick up and delivery from your home. Whether your pet is in need of physical rehabilitation or simply needing more exercise to shed a few pounds, our therapy pool could be the perfect solution for your pet's specific needs. 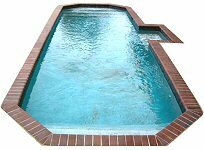 Hydro therapy is also offered for injury treatment, arthritis and post surgery healing. 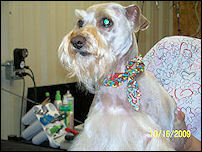 Please contact Pet Country Spa at 972-524-2184 to get on our email list for dates and times of conformation classes. Please bring your leash and treats. If you have dog that suffers from allergies, Nature's Variety also offers "Prairie", a dry food that is free of soy, corn, and wheat. We have Nature's Variety canned and dry food "Instinct" in Duck, Rabbit, and Venison. This hypoallergenic diet comes in a variety of meats including, but not limited to, Chicken, Rabbit, Venison, Salmon, Duck and Organic Chicken. We also have a variety of prescription diets. 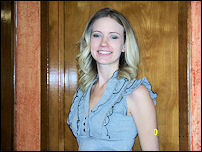 These diets include weight control, kidney, liver, heart and other special purpose formulas. 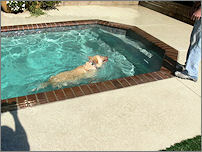 At Pet Country Spa, we have over 200 large and small kennels to board your dog or cat comfortable while you are away. We also have Kitty Condos for our feline friends. As a prepaid boarding customer, you can also enjoy our special Sunday pick-up times from 4:00 p.m. - 6:00 p.m. For our boarding and medical clients we now pick up and deliver to Dallas, Mesquite, Forney, Terrell, Kaufman and surrounding areas. Visit our Boarding section for pre-boarding instructions and helpful client information. 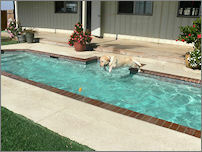 Happy Clients Boarding Fees: Dogs start at $20.00 per day per dog. Cats are $14.50 per day per cat. Grooming, bathing, skin and nail care, massage and teeth brushing are always available and recommended. 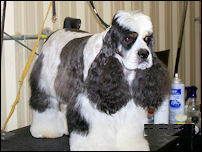 Visit our Grooming section for additional information. Texas A & M mascot, Reveille. 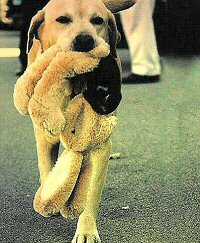 When he was at TAMU in the 1960’s, Reveille #7 was in the distant future. The staff loved having “Miss Reveille” visit our Pet Country Spa location in Terrell, TX. What a privilege having this celebrity at the Spa. It is no secret that stem cell therapy is rapidly growing into one of the largest alternatives in veterinary pain management. Stem cells are being used to improve the lives of animals that suffer from osteoarthritis as well as tendon and ligament damage, joint injuries, and fractured bones. 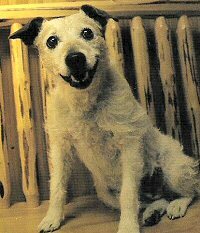 Roughly 25-30% of dogs and cats suffer from osteoarthritic conditions and degenerative joint disease. Other common ailments where stem cells may provide relief for your animal include hip dysplasia, joint/cartilage damage, ligament damage, and tendon damage. 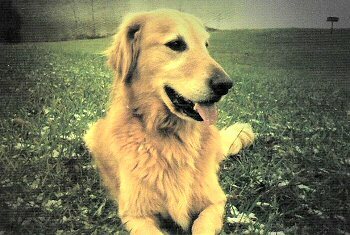 Other treatments, such as NSAIDs, only attempt to reduce symptoms and can sometimes leave the animal feeling lethargic. As an alternative, using MediVet America's stem scell therapy allows your Vet to treat the cause of your animal's discomfort, not just suppress the symptoms. Common signs of osteoarthritis include your animal's inability to get up and down steps, general stiffness in gait as well as marked inability to recover from exercise for a long period of time. Stem cells simply explained are your animal's own repair cells. There are many adult stem cells in fat tissue, however they are dormant. MediVet's pataentd stem cell procedure allows your vet to isolate stem cells from your animal's own fat tissue, activate them, and re-inject them directly into the damaged areas all in one visit. The goal of this revolutionary procedure is to provide a potent anti-inflammatory effect promoting cartilage and other tissue regeneration ultimately creating a healthier joint environment. Most importantly, it's an all natural approach to healing without the adverse side effects and complications of drugs or surgery. The advantages of using MediVet's technology is not only the affordability, but it's safe, non invasive, and drug free. 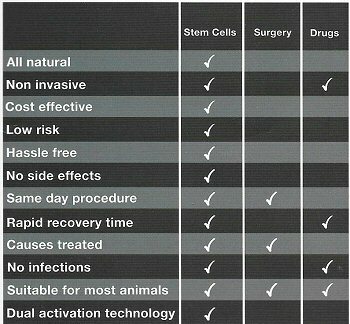 There is no comparison, as MediVet stem cell therapy is the most logical cell therapy choice for treating osteoarthritis, degenerative joint disease, hip dysplasia, tendon, ligament, and bone injuries. 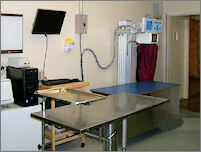 MediVet's goal is to improve the quality of your pet's life, as we have done for the 1000's of animals we've treated. Although revolutionary, stem cell therapy is now available and affordable right here in this practice. On procedure day, your vet will make a small incision and collect a small amount of fat (either in the belly or behind the shoulder blade). The sample is then carefully processed by a highly trained Veterinary Technician. Ater the cells have been isolated, then activated, they are ready for injection into the areas that need repair and administered intravenously. After the procedure you will be able to take home your beloved pet later that same day. While your pet may feel better quite rapidly, this is due to the natural potent anti-inflammatory effect these cells have. That being said, we recommend that you leash restrict your pet for the first 30 days after the procedure, allowing these regenerative cells to promote the desired repair. Typically, significant improvement starts after only 3 weeks but improvement can continue long after the first procedure date. Although every case is different on average MediVet Veterinarians report 1-3 years of relief from a single injection when treating general mobility issues. In for a Spay or Neuter? More and more pet owners are choosing to harvest fat at the time of a standard spay/neuter procedure, in order to bank stem cells for the future. Much like parents do for their children by banking umbilical chord blood, pet owners can now bank their pet's adipose stem cells. Since the fat harvest requires anesthesia, collecting fat early removes that risk for older pets. Some conditions, such as heart disease, would make anesthesia far too risky, and your pet would not be able to benefit from stem cell therapy. Young animals have a far greater number of stem cells, so this will give your pet the highest number of stem cells for future use. 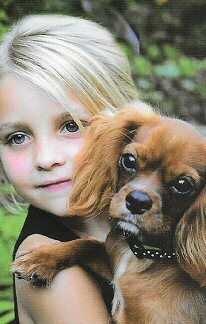 Banking your young pet's cells is the best insurance you can have to be ready to take advantage of the rapidly growing list of diseases being helped by stem cell therapy. Collecting stem cells for banking is important for future regenerative veterinary medicine care. Most pet owners choose to bank cells, so re-treatment is easy. 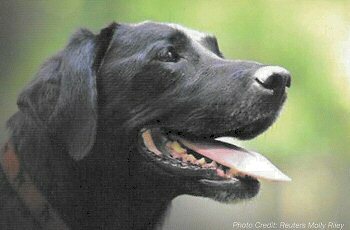 If symptoms return, your vet merely requests a dose of cells from the lab, and injects them. No further surgery is necessary. Collecting stem cells early will maximize the dosage and effectiveness, reduce complications associated with anesthesia, and increase cell yields. In a recent study published in Veterinary Practice News, 155 canines who suffered from moderate to severe osteoarthritis from four independent veterinarians across the country were assessed and assigned a quantified score in areas of pain, lameness, and range of motion using a standard scale on days 1, 30, and 60. After 60 days, 98 percent of the subjects showed improvement in the pain category with an average decrease in pain felt by 77 percent. After 60 days, 98 percent of the subjects showed improvement in the lameness category with an average decrease of 65 percent. 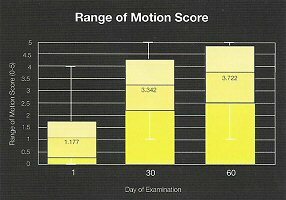 After 60 days, 96 percent of the subjects observed had exhibited an improvement in the range of motion category, showing an increase of 51 percent. Overall, 99 percent of the canines in this study showed improvement in one or more of the three categories, thus showing that stem cell therapy is an effective treatment for canines who suffer from moderate to severe arthritis. On Day 1 of the study, the average pain score reported was 4.1. By Day 30, the average pain score had dropped to 1.4, a decrease of 66 percent. On Day 60, the pain score dropped to 0.93. From Day 1 to Day 60, the pain that the canines felt decreased by 77 percent. Across the board, the dogs in this study showed a significant decrease in their pain level after both 30 and 60 days from participating in stem cell therapy. The adjacent figure shows the decrease of lameness experienced by the canines participating in this study over the 60 day period. 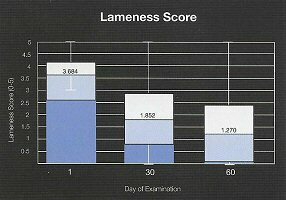 Lameness was assessed and quantified using a scale of 0-5, with 0 being no lameness in the affected area and 5 being complete lameness in the affected joint. After 30 days, the average lameness score dropped from 3.7 to 1.9, giving a 49 percent decrease. After 60 days, the canines exhibited a lameness rating of 1.3 for a total decrease of 65 percent. The adjacent figure shows that the canines experienced an increase in the range of motion of the affected joint after both 30 and 60 days of participating in stem cell therapy. After 30 days, participants saw an average increase of 45 percent, and a 51 percent average increase after 60 days. Based on these figures, participants experienced the majority of their improvement within the first 30 days of treatment, while continuing to show improvement between 30 and 60 days. "It has been a dramatic difference. Red for the last two years, instead of being able to work, has had to stand around or lay around. Now, she acually has been playing with other dogs, going up stairs, and trying to jump in the truck. It's been a big difference! This past weekend, she got to work and it was exciting to her and to us!" 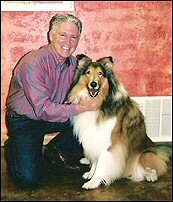 -Kirby's owners DVM David and Debbie Marion "The day Booster saved my life I promised him I would never take life for granted. MediVet America performed the procedure which promised to help Booster overcome his disabling arthritis. He was facing retirement if not for the stem cell implementation he received. Thanks to this innovative technology, Booster is able to continue to demonstrate his abilities instead of staying home." "Cowboy has arthritis in both elbows and wrists, and tore his right ACL 9 month ago. I can't believe how he is running and playing just twenty-two days after stem cell therapy. I am so happy to have my dog back!" World's most Trusted and Researched Low Level Laser! Solutions for the Care of Equine, Canine, Feline, and Avian Animals. Take away their pain without harmful side effects. Since our inception in 1996, Erchonia® Corporation has embraced the philosophy of tirelessly exploring the possibilities of low-level-laser therapy (3LT®). From theory to therapy, our products are strongly supported by; thorough and statistically significant clinical data. This dedication has rightfully earned Erchonia® five FDA clearances along with a plethora of publications in peer-reviewed journals. Erchonia's research and development is driven to provide alternative non-invasive, drug free solutions for doctors, scientists, nurses, and other health care professionals who are dedicated toward improving the lives of others. Erchonia® proudly adheres to the highest ethical standards in the work that is conducted in the laboratory, as well as within our in vivo clinical trials. Erchonia® understands that better outcomes for patients often rely on new or improved therapies. Non-invasive laser therapy for the reduction of pain was the first treatment by Erchonia® Corporation proven by (2) double-blind clinical trials more than 10 years ago - revolutionizing the practice of laser medicine and paving the way for laser therapy. It is not uncommon for a pet or trusted animal companion to become a part of the family or transition into a trusted work partner, and as owners we attempt to provide as much as we can to ensure the quality of their health and preserve vitality and energy. The medical disorders that plague us are not that dissimilar to those that affect our animal companions. Unfortunately, cost can sometimes be the biggest hurdle when attempting to provide the best possible care for your pets. Muscle sprains, arthritis, tendon and ligament damage, fractures, and general inflammation can severely impact the quality of life of your pet with only a narrow selection of therapeutic options available to provide relief. Fortunately, a trusted technology, one that has earned Food and Drug Administration clearances to treat human chronic/acute pain, inflammation, post-operative surgical pain, carpal tunnel pain, and non-invasive fat reduction and body contouring is now available for the treatment of a wide-assortment of medical conditions that may be affecting many of your animals. Low-lever laser therapy (3LT®) is an exciting new technology but it is important to understand that certain parameters must be satisfied in order for it to function as an effective therapy. Erchonia® Corporation has performed numerous histological and clinical studies and has combined all the essential components of light therapy to ensure that your animal companion receives the best results restoring quality of life.